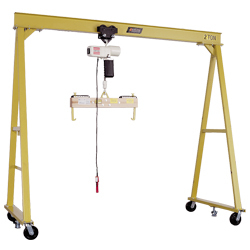 Industrial Gantry Cranes and Booms from BHS safely lift and transport extremely heavy loads. They are ideal for manufacturing operations that work with metal components, including automotive and industrial equipment providers. Jib Booms are also used to transport freight vertically in warehouses and across the supply chain. Sales specialists at BHS will guide you toward a Gantry system to solve any material handling challenge. If an existing stock piece of equipment is not quite right for your application, the BHS design and manufacturing teams will custom-build a Gantry or Boom to your specifications. Call BHS at 1.800.BHS.9500 to learn more about Gantry Cranes and Booms. Comes in a variety of powered and non-powered options. Lifts loads on its own or fitted onto a lift truck. High-capacity lifting with powerful hydraulics. Many industries rely on heavy equipment such as Gantries and Jib Boom Cranes to transport loads, both vertically and across the floor. Warehouse operators use them to lift pallets from ground level to other floors or mezzanines. Manufacturing facilities often contain Gantries to transport bulky materials into production lines. Construction crews use them to move building materials to upper floors. 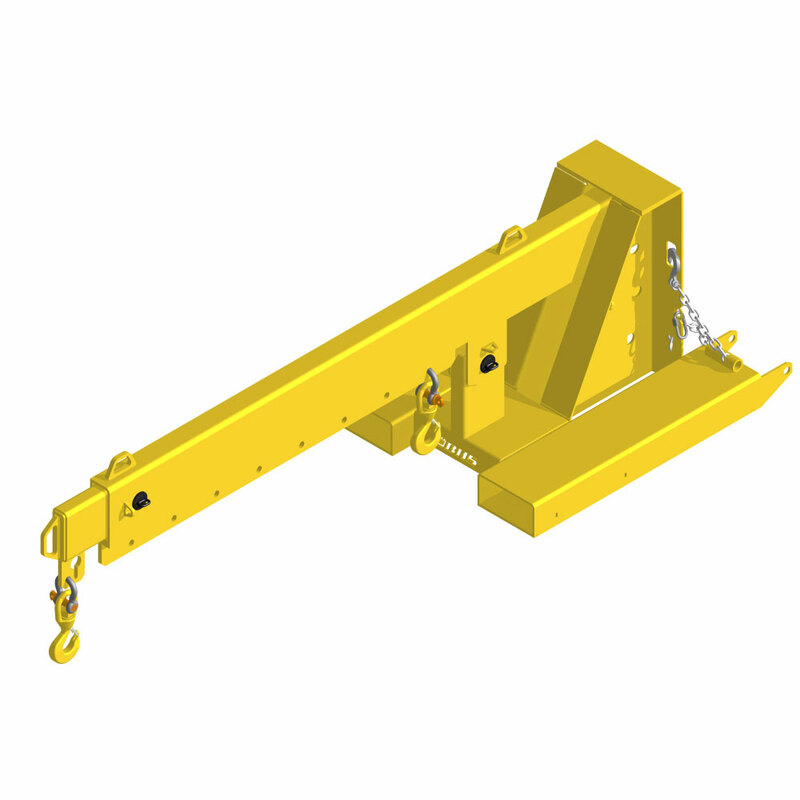 Gantries and Jib Boom Cranes are staples of all material-handling applications. Horizontal movement of materials, up to 20 feet at a time. Vertical lift distance of up to 10 feet—or more, with custom options. Load capacities up to 6,000 pounds. Option to move the Crane system via heavy-duty phenolic casters. BHS Gantry Cranes are modular A-frame units that can be expanded as your needs grow. They come in a variety of powered and non-powered options, with different height and length specifications to fit anywhere. Custom designs are also available. Handling loads of up to 6,000 pounds for some manual models. Lifting up to 3,000 pounds for powered models. Suspending machinery or heavy parts for assembly. Transporting components from one elevation to another. Carrying lifting equipment via forklift. 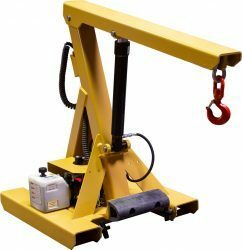 All BHS Gantries and Jib Booms are made of pure welded steel, with a powder-coat finish that protects them from rust, impacts, and the chemicals sometimes associated with manufacturing and material handling facilities. They offer great dependability and long working lives to provide a quick return on investment. By preventing the manual lifting of heavy loads, Gantries and Jib Booms protect staff from the risk of musculoskeletal disorders. They also boost productivity by eliminating a key material handling challenge. Click on any of the products listed above to learn more and check technical specifications to match your unique application exactly. BHS supplies a network of material handling equipment dealers across the world. All BHS products ship from a cutting-edge manufacturing facility in St. Louis, Missouri. To find your local dealer, call the BHS sales team at 1.800.BHS.9500.